Getting Naked for Money: An Accidental Travel Writer Reveals All is an engaging and witty memoir written by my erudite but very down-to-earth travel writer friend and colleague, Edie Jarolim. Edie graciously agreed to sponsor a giveaway of her new book for readers of More Time To Travel. Have you ever wondered whether the day-to-day life of a travel writer is as glamorous as it seems to be? Thought about the skills it takes to a launch such a career? Are you a woman of a certain age wondering what it would be like to travel solo? —–then you’ll want to read Edie’s book to get the inside scoop. My Q &A with Edie is below. To be eligible for the giveaway, leave a brief comment below telling why you would like to win a copy of Getting Naked for Money. 1) What was your intent in writing this book: memoir, catharsis, cautionary tale to prospective travel writers? All of the above, though I didn’t know it in advance. Getting Naked for Money (GNFM) was on my writing backburner for probably a dozen years, so finishing it was definitely cathartic. In general, people can only know selected parts of other people’s lives. That’s even truer when you are a freelancer and on the road a lot, which limits social interaction. Many people, including friends and acquaintances, thought I led an exciting, glamorous existence. I wanted to set the record straight. But there was an added benefit that I didn’t know about until I finished the book. Writing a memoir is a way to make sense of your life, to see it as a narrative like any other narrative—including fictional ones. It’s easy to fall into the trap of feeling you haven’t accomplished much because there’s so much more you could do. Looking back, I saw I’d accomplished quite a bit – and in fashion that was less hit-and-miss than I’d imagined. 2) I know that this project evolved from a Kickstarter project. Why did you choose to go that route rather than conventional publishing? I published four books in the traditional fashion, three travel guides and one dog guide. The first three–Frommer’s San Antonio, The Complete Idiot’s Travel Guide to Mexico’s Beach Resorts, and Arizona for Dummies–were part of a series and therefore not creative endeavors. Am I Boring My Dog? And 99 Other Things Every Dog Wishes You Knew was the first book that was strictly my idea from start to finish and I was really disappointed in how little support I got from the publisher. Nothing personal; that’s just the way things are today. I knew I was going to have to work hard to market GNFM so I thought I might as well get all the financial benefits. Raising funds through Kickstarter gave me an opportunity and impetus to finish my book – and it was also a form of pre-sale as well as pre-publicity. My contributors were buying my memoir in advance. And they were rooting for me. 3) You start off the book with an assignment to cover a story for More magazine at a buck naked resort. What was the most interesting assignment you’ve had as a travel writer? Was it this one? Why? Going to a nudist resort was definitely my strangest assignment, but being assigned to update Frommer’s Egypt was the most interesting. I’d loved Egypt since I was a kid, and the opportunity to go there as a researcher was a dream come true. The trip was not without its glitches, as GNFM discloses, but the country never disappointed me. 4) Which of your written works are you most proud of (book or article)? Why? This memoir, no question. It was the most difficult to write; I had to work very hard to make it look easy. But the response to it was everything I could have hoped for and more (well, except for the part where it becomes an instant best seller). Readers have really embraced it, and said it made them laugh as well as think, which was my goal. 5) Given all the information on the internet, are travel guides dead? No. People still want guidance from experts, from someone who has had enough experience to know what they’re talking about – now more then ever. Travelers are faced with a glut of information, much of it from the restaurants, attractions, and destinations themselves. Travelers need help in sifting out the truth from the hype. Guidebooks are now more portable if you read them on Kindle; you can bring along more than one. 6) If an aspiring travel writer asked you for advice, what are three specific things you would tell him/her? Focus first on your writing. There’s nothing a travel editor dreads more than to get a query along the lines of “Would you send me to [x glamorous destination]? I really love to travel.” Lots of people love to travel. Not everyone can write (though the internet would have you believe otherwise). Hone your craft and find your voice. Be open to experience. The best travel writing reveals something new – about a country, about the people in it. You can’t be a successful travel writer – or human being, for that matter – if you traverse the world with pre-conceived notions that you’re unwilling to let go of. Be willing to work hard. Travel writing is a dream job for many, many people. Pay your dues. Start with pitching local publications. Interact with others in the comments section of travel blogs. Offer guest blogs tailored to them. Don’t expect people to pay attention to you without paying attention to them – and their editorial needs — first. Edie Jarolim earned her Ph.D. in English and American literature from NYU and worked as a guidebook editor at Frommer’s, Rough Guides, and Fodor’s before moving to Tucson, Arizona, to become a freelance writer (or, as her mother might have put it, “You left your good job in New York to go where? To do what?). She has authored five books, including this memoir, and her articles have appeared in publications ranging from Art + Antiques and Sunset to The New York Times Book Review, National Geographic Traveler and The Wall Street Journal. 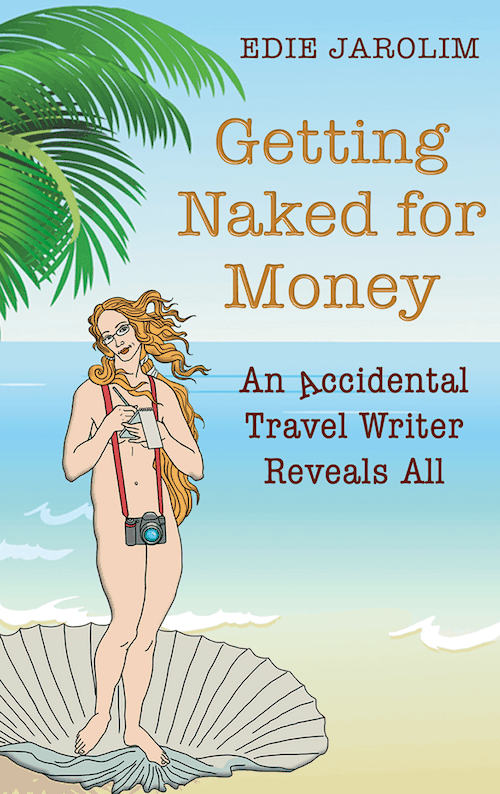 Enter to win a copy of Getting Naked for Money: An Accidental Travel Writer Reveals All. To enter, simply leave your name below with a brief comment telling why you would like to read Edie’s book. One randomly selected entry will be chosen to win the paperback version of the book. If the winner selected lives out of the country, he/she will received a Kindle version. Contest ends at midnight December 31, 2016. Congratulations to the winner of the giveaway, Barbara Rogers! Can’t wait to read the book or purchase it as a gift for your favorite traveler? You can purchase a copy of Getting Naked for Money on Amazon. I have always been interested in travel writing and this looks like a great read! I was drawn here because I’m a hard-core reader of travel writing, including guides, and I love a good memoir. I’ll be reading this, regardless of the giveaway! Again, congrats to you! I like sassy memoirs and love the cover illustration. I just know something juicy and dishy will be inside. I love a book with a humorous bent. My husband has always dreamed of being a travel writer. We travel a lot and now that he is semi retired perhaps he will pursue this and stop following me around the house. I am a solo traveler and good writer. I also am retired and am going to Mexico for a few months spending a part of my retirement nest egg to live in another culture. I am going to travel around the country as resources permit and write about the stuff that tourists don’t see or experience. I would like to share those experiences with others. I would love a copy of your book as a guide to how to do this successfully. Thank you for the opportunity. I don’t travel much so I’d love to read her adventures. I’d love to hear the backstories of some of Edie’s adventures! I came to know Edie via Twitter in the \”animal welfare\” world and then read \”Am I boring my dog\” and loved it. I honestly had no idea though this was a kickstarter campaign or I would have been on board since day 1. I am a former Rock music magazine writer myself, now a travel agent so this book is right up my alley and I would love to read it. I enjoyed Edie\’s writing style. Writing about Travel professionally sounds grueling to me as I know from personal and clients experience how brutal the actual travel part is. But I would love to read all the backstory tales Edie went through. I love to travel and this book will be a great read. I want to read this because I want to become more adventurous myself. i would love to read this. it sounds really good. I’d like to read this because it sounds like a unique book with an interesting point of view. I have sort of a “Pay It Forward” reason for wanting a copy of the book. When Edie lost her beloved Frankie, I was one of the folks who contributed in his memory to “The Grey Muzzle Organization” that advocates for senior dogs. I still contribute regularly. I would not only like to have a copy of the book to read but to be able to carry it with me to help publicize it. I want to promote it as a way to thank Edie (and Frankie) for introducing me to Grey Muzzle. That was such a help to me after I lost my special girl, Lucy. Marcy, you contributed to my Kickstarter campaign. I would love to send you a copy of my book, even if you don’t win it! Please contact me via with your address via ediejarolim.com. And, yes, Frankie puts in an appearance in the memoir. I love to travel. I secretly want to be a travel writer even though I’ve never had a blog, wasn’t an English major, ect. Plus the title of this book is a hoot! How could you not want to read a book with this title!? Traveling is something I absolutely love to do when I get the chance. I’m having a baby any day now, so my traveling may be put on hold for awhile. So for the time being, I can read about other’s travels. ? I love traveling and hearing the perspective of someone else could be fascinating. I would very much enjoy reading about different people and places, and most of all I expect there would be a lot of amusing details and incidents! It must be well written if the author worked for Frommer’s, etc. !